Senior BJP leader and former Chief Minister Shanta Kumar today demanded a CBI probe into the HP CPMT paper leakage scam in Himachal. Mr Kumar said since some high ups and relations of ruling party leaders were involved in the scam, so the state police could not do justice, and the paper leakage scam should be handed over to the CBI for probe. Claiming the support of majority of delegates, some BJP leaders and state delegates from Himachal held a closed door meeting at Chandigarh today to impress on the high command to hold election of the state’s party chief. 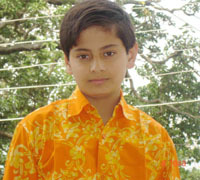 Master Karan Attari, a Class VI student at Barmana in Bilaspur district, who has been selected for the lead role of ‘Golu’ in serial ‘Golu in Goggle’to be telecast on Star Plus from Novermber 24. He was selected at the all-India level. Revenue and Panchayati Raj Minister Sat Mahajan expressed concern at delay in the allotment of the two biswa land in rural areas and one biswa in urban area to the landless poor of the state as per the government policy and has directed the bureaucrats including all DCs and Financial Commissioner to take steps in this connection. KANGRA: National Press Day was observed here on Thursday by the Trigarth Press Club. In a press note here today Mr Kumar said with the arrest of a brother of a Cabinet Minister and relation of another Congress leader, it appeared that persons close to the powers to be had a link with this scam. He added after the arrest of relations of ruling party leaders, the police was working under pressure from high ups to hush up the matter. It is learnt some of BJP leaders from Himachal, including former MP, Maheshwar Singh and former Health Minister, J.P. Nadda, were present at the meeting in Chandigarh. Supporters of former Chief Minister, Shanta Kumar and state’s BJP chief, Suresh Bhardwaj also attended the meeting. Party sources said some of the delegates, who form the electoral college for the state BJP chief’s election undertook a signature campaign to impress upon the high command to hold elections as majority of the delegates were with them. “We will give these signatures to the central leaders and demand that election be held as majority of the delegates were in favour of Mr Maheshwar Singh as state’s party chief,” said a leader at Chandigarh. These leaders will central leaders in Delhi tomorrow and hand over signatures list. Some of the leaders from the Dhumal camp claimed that fake signatures were being put on this request. They said some state BJP leaders had already informed the central leadership about the meeting in Chandigarh. Mr Mahajan was speaking at a meet the press organised by the Trigarth Press Club here last evening. He said removal of encroachments in the forest area was a priority of the government. He decried the previous BJP government for encouraging encroachments in the forests. He said during second phase encroachments on national highways would be removed.